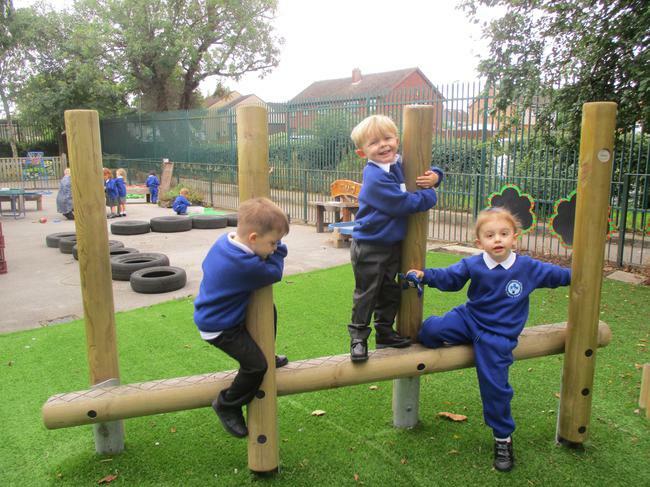 We have really enjoyed helping the children settle into the Nursery class routine. It was lovely to see the returning children and observe how they welcomed and involved the new children so well. We have been watching them interact as they explore the indoor and outdoor classrooms and can safely say that friendships are blossoming. 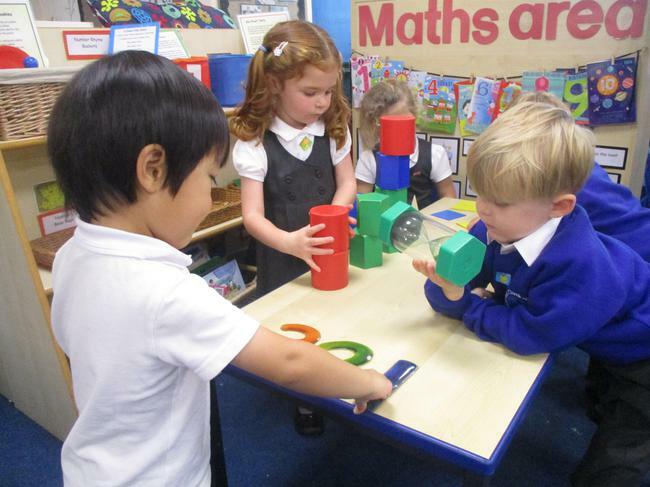 This year, for the first time, children in Nursery may be entitled to or opt for ‘30 hour provision’ (08.30-14.30 hours). This means that many of our children now have lunch in school. 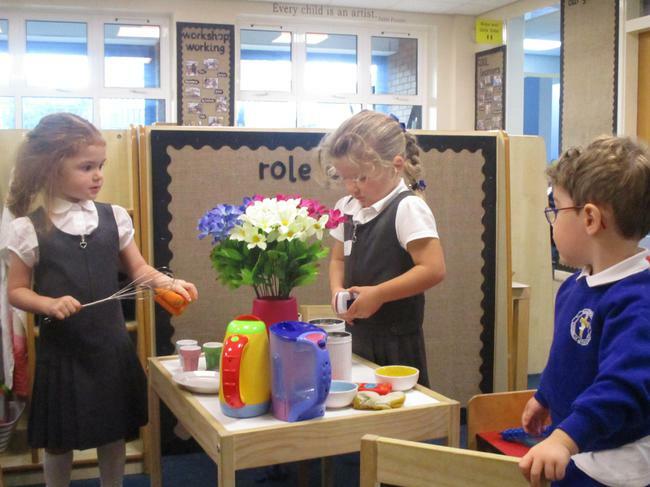 Full-time children bring a packed lunch and enjoy dining with their classmates. They enjoy comparing and discussing the contents of each lunchbox and it is a relaxed time, also accompanied by peaceful background music. We have noticed an unusual silence descend as lunch is devoured!!!! You may remember from our learning stories that our class bear was new and did not have a name! The children were encouraged to think of suitable names for No-Name Bear and also went on a treasure hunt to find hidden names. Finally, we settled on the name Scout. Scout the Bear gets lonely at the weekend and loves to go home with a child to spend time with them. When it is your child’s turn, he/she will bring Scout home and hopefully have an exciting time, and then, tell us all about it on Monday morning. We spent a wonderful week thinking about friendship and what it means to be a kind friend. We used some super stories to illustrate sharing and caring, including ‘The Selfish Crocodile’ and ‘The Rainbow Fish’. The children really enjoyed both stories but particularly enjoyed how the rainbow fish learned to be a good friend by sharing his beautful, shimmering scales. 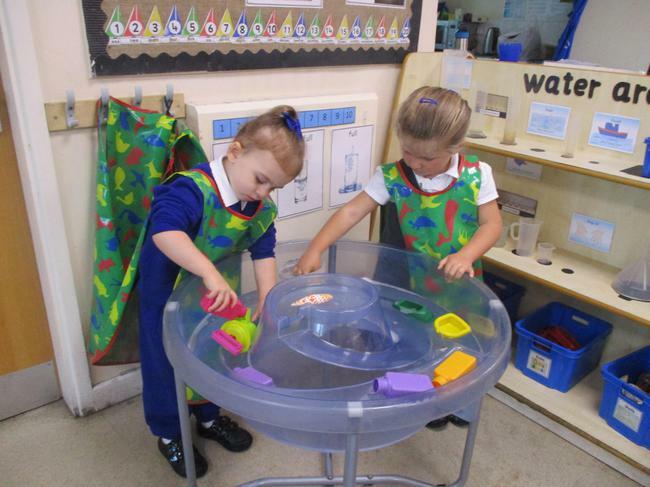 Children enjoyed using puppets to recreate the story and were delighted to find out that the rainbow fish had left us some shimmering, kind ‘hands’ to give out to sharing and caring children. Starting in October, your child will bring home a school library book each week to share with you. We hope that these will supplement your own reading range and ensure your child realises that reading is important at school and at home. As a school, we are passionate that children should be ‘Reading for Pleasure’. Library books are sent home on Friday and are to be returned on Wednesday. We have enjoyed learning about Diwali, the Hindu festival of light. We found out facts about Diwali by reading fiction and non-fiction books. We also watched a film about a boy called Shyam and how his family prepare for their Diwali celebrations. It was interesting to see him visiting a temple with his family to light candles and say prayers. We talked about their traditions and recognised some similarities to the way we prepare to celebrate Christmas as they send cards, give presents, decorate their homes, wear special clothes and prepare a family meal. During the week, we set up an inter-active Diwali display so that the children could explore some of the objects that Hindu’s have in their houses during Diwali. After looking at pictures of Indian dancers with dandia sticks, we set the children a challenge to make their own dandia sticks in the workshop. Many children made fantastic dandia sticks and decorated them with repeating patterns. We played Bhangra songs and had great fun moving to the beat of the music. Many children worked in the writing area and made beautiful Diwali cards for their friends. The children were extremely creative in the outside classroom using coloured chalks to make Rangoli Patterns. We also set up large trays for the children and they were highly involved exploring coloured glass beads and designed some fantastic patterns. We were very lucky to have a special visitor, Monica, who talked to us about Diwali and had prepared food for us to taste. 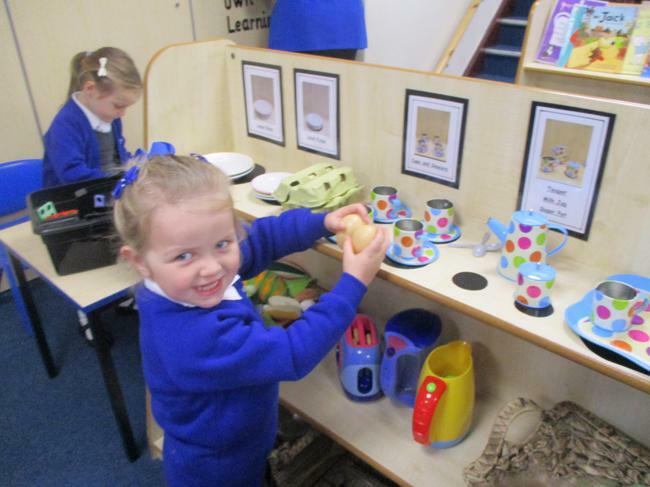 The children were very keen to sample the dishes. A few children were spotted making several visits to the buffet table! Monica also showed us how to wear a sari. The children had great fun choosing traditional saris and coloured bindis to wear. The teachers dressed up in traditional Hindu costumes and a great day was had by all! It was fantastic to observe the enthusiasm the class had for learning about other cultures, communities and traditions. 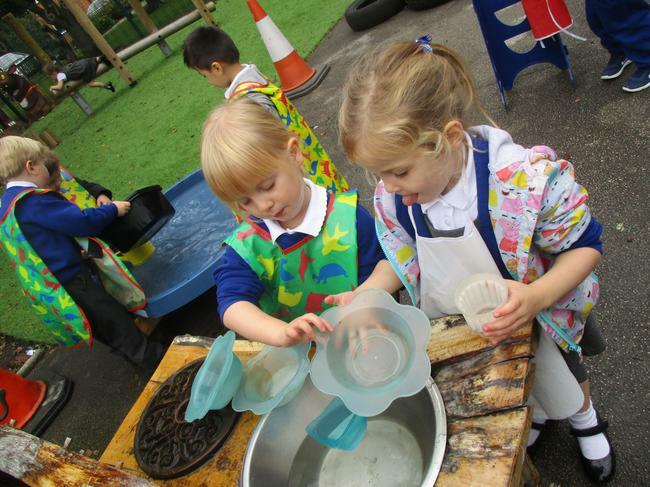 The children displayed high levels of involvement during the week and it was amazing to watch them develop their ideas and extend their own learning. It was lovely to see the children arriving in school so excited to start our own celebrations. 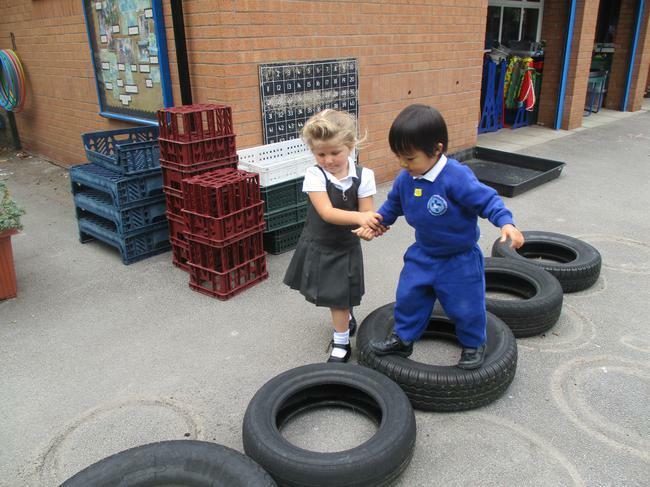 There was a wonderful atmosphere in the Foundation stage Unit as the children wandered from activity to activity, encouraging each other to participate. In class we remembered all of the brave soldiers who fought in World War 1. We talked about the uniforms that the soldiers wore and how difficult it was fighting in the trenches, often going without sleep and food. We also thought about the doctors and nurses who cared for the injured soldiers and helped to make them better. We looked at pictures of medals that were awarded to soldiers and nurses for being courageous and helpful. Some medals were star shaped and some were circles. We particularly liked the rainbow coloured ribbons attached to the medals. This led to a discussion about the significance of the poppy flower and why we wear a poppy in November to remember the brave people involved in the War. After the lesson, the children were highly involved in the workshop making their own poppies. They competently used a variety of tools and materials to create their poppies and were quite rightly proud of what they achieved. We enjoyed sharing the story ‘Best Loved Bear’ by Diana Noonan. This book gave us the idea of having our own best bear competition and a teddy bears picnic. The children were highly involved writing party invitations. On Friday we had great fun at our teddy bears’ picnic and everyone brought into school their favourite teddy bear. They believe in one God. They pray 5 times each day. They take their shoes off and kneel down on a prayer mat. They must ensure that they pray facing the direction of Saudi Arabia. The prayer mat we looked at had a compass on it. They believe in helping others and give money to charitable causes. During the month of Ramadan they fast and do not eat from sunrise to sunset. The holy book they read is called the Quran. It is printed in Arabic which is read from right to left, so they open their book at the ‘back’ to begin to read. They cannot eat food containing gelatine, as all of their food must be Halal. Nursery children had a wonderful time dressing up as characters from their favourite books on World Book Day. Responding to the theme ‘Share a Story’, the children each brought in a book that they were happy to swap for another so everyone had a new story to take home. The children had great fun taking part in Science Week. We carried out an investigation into mixtures and made our own porridge! This fitted into the learning we had been doing around the wonderful story of 'The Magic Porridge Pot'. There was great excitement when Mrs. Kiziltan got the recipe wrong and we had to separate the mixture back into its original components. 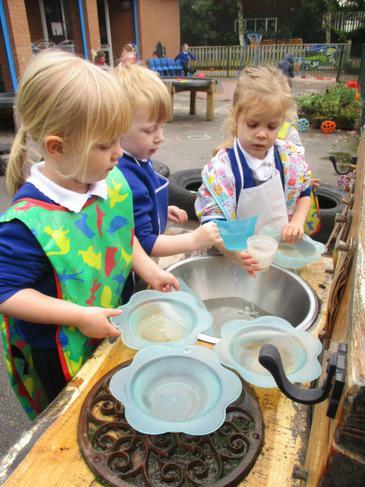 It was wonderful to observe the children's enthusiasm as they took part in this practical experiment. Sadly, we said goodbye to Mrs Dunn as she moved on to 'pastures new' when we broke up for Easter. Mrs Dunn has been a much-loved teacher at Halewood CofE, who has provided so many children with a brilliant start to school life. Learning was ‘always fun with Mrs Dunn’! We wish you well Mrs Dunn and hope you enjoy spending a bit more time with your family before you decide what to do in the future. With love from the children and staff in EYFS. Nursery had a fantastic time in the hall today. Mrs Scott and John taught us lots of games that not only developed our PE skills but our listening skills too. We moved in a variety of ways and followed her instructions. 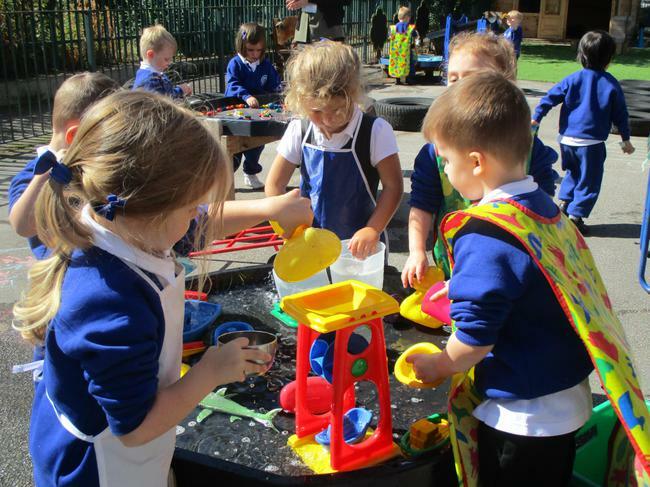 Spring has well and truly arrived and Nursery children were keen to find out more about this exciting season. With the help of some traditional tales and a sprinkling of science knowhow we began to learn lots of new things. Springtime traditions such as ‘spring cleaning’. 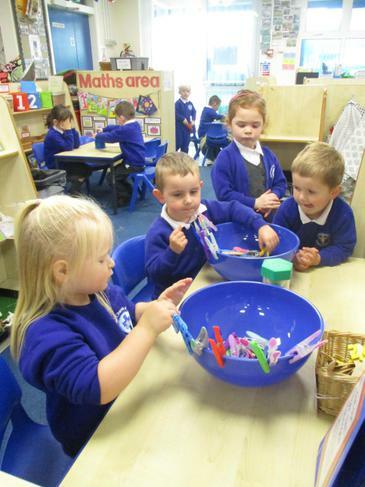 ‘Jack and the Beanstalk’ gave us lots of ideas for activities, but planting our own beanstalks was a priority. Each of the children had the opportunity to plant a bean and watch for signs of growth. We have shared non-fiction books and ICT to support our learning of how bean seeds germinate and grow. We even read about how ‘Baked Beans’ are made! Yummy! With such a focus on new life/growth we couldn’t resist having a Garden Centre as a role play area. As you can see – it has been a huge success. BUT...Mollie had a question! Can we answer her question next week? Watch this space and find out! Mollie’s Question: What is Pollination? Well, there wasn’t time to adequately explain pollination there and then – but – patience is a virtue! Get ready to meet Lily, Lily and Bertie Bumble Bee! May I have some pollen please? Lily, Lily and Bertie all need pollen but for different reasons. Most flowers need pollen from another flower to produce seeds. But, flowers can’t walk, so how can Grace’s lily flower move pollen to Phoebe’s lily flower? Bees need pollen to make bee bread and they collect nectar at the same time to make honey. How can Bertie get some pollen and nectar to take back to the hive? Take a look at our slide show to find out what happened.